There's this blog whose existence I became aware of recently when a Rioter told me they used a picture of me on one of their blog posts. It's run by someone named "Selina Anderson" and seems to mine random snippets of other pagan blogs along with random photos from even more pagan blogs and posts them under the aforementioned Ms. Anderson's moniker. Just because I'm That Guy, I did a little clicking around. This is Selina Anderson on Google+. This is her YouTube account. She also claims on her Google+ account (seriously, who uses Google+?) that she contributes to something called Esoteric Soup and Alchemy and Alchemists. See...here's the thing about us Pagan folks. We're a small community. If you want to use something of ours, just ask. We will very likely say yes. We might have stipulations, but we don't mind sharing. But what's ours is not yours for the taking just because you like the picture or the spell or the quote or whatever. Do I really need to have the Copyright Infringement discussion all over again? 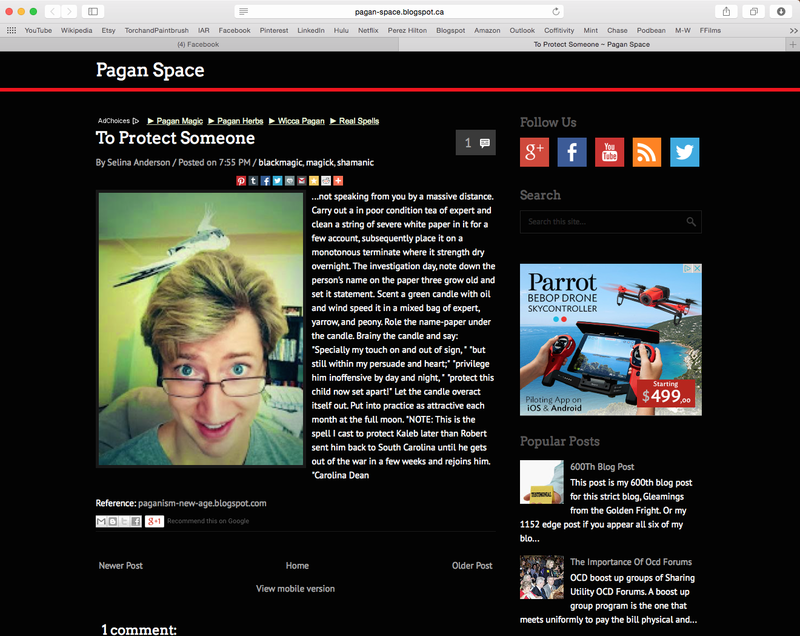 Suffice to say, this blog, "Pagan-Space" is not affiliated with "PaganSpace.net", the social media platform for pagans to chat about...stuff. It isn't even filled with original information. It just posts, seemingly automatically, every few hours with a snippet of information and a random picture. Selina... Honey... You've angered witches. I really, really wouldn't want to be you right now. You might want to take down your entire website...before we do it for you.